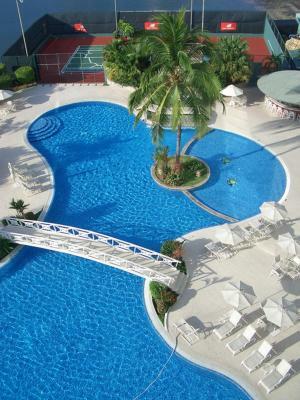 Lock in a great price for Intercontinental Miramar Panama – rated 8.5 by recent guests! The hotel was beautiful in design and elegance. The staff was friendly and hospitable. Comfortable mattress and feather pillows. Great view of the ocean. I was attending a wedding in the Intercontinental Miramar Panama so we decided to stay there to be more comfortable. The hotel facilities and staff service was very good. We order room service several times and it was very fast! The view from my room was the see and the Casco Viejo, Beautiful! The location. Our second room. The gym facility and pool location. Great location and view of city and ocean. Large pool and very nice pool area. Comfortable room and bed. We were upgraded to a lovely two bedroom corner suite with breathtaking views and a gorgeous balcony so we had a really fantastic deal. The swimming pool in this hotel is supposed to be the best hotel pool in Panama City. It’s an awesome and relaxing, albeit smallish pool but it offers plush towel service and handsome pool furniture in a nicely landscaped area. The location is good if you want to take short taxi rides to the old town. Walking is an option along the lovely bay but it’s a bit of a hike. This was the best hotel stay ever!!! The breakfast buffet was amazing and there was so much good food and it was free. The pool was beautiful and the staff was so friendly. The beds were like sleeping on clouds. Intercontinental Miramar Panama This rating is a reflection of how the property compares to the industry standard when it comes to price, facilities and services available. It's based on a self-evaluation by the property. Use this rating to help choose your stay! The Intercontinental Miramar Panama features guest spa facilities with massage services, a sauna and a fitness center with certified instructors. 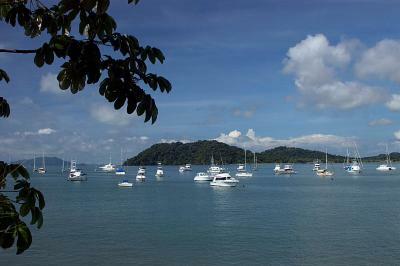 Located a 9-minute drive from central Panama City, this hotel is ideal for business or pleasure. The fresh-decorated rooms and suites are air-conditioned and feature ironing appliances, working desks and a coffee maker. A flat-screen cable TV, a minibar and a hairdryer are also in-room amenities. The bathrooms are private, have bathtubs and provide free toiletries. The Bay View Restaurant is specialized in buffet services, organizes cultural nights and overlooks the marina. It serves typical Panamanian dishes, seafood, Spanish cuisine and features a wide variety of desserts. The Lobby Bar provides the guests with a variety of drinks. Located between Balboa Avenue and Paseo Cinta Costera, Intercontinental Miramar Panama is a 15-minute drive from the Historic Centre and the Panama Channel Museum is 2 miles away. 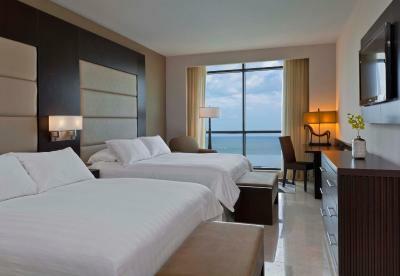 When would you like to stay at Intercontinental Miramar Panama? These comfortable rooms include amenities like flat-screen cable TVs, iPod docking stations, coffee makers and minibars. Bathrobes and hairdryers are available in the private bathrooms. Featuring exclusive access to the Club Lounge, which provides complimentary breakfast, drinks and evening appetizers from 6 pm to 8 pm, these rooms include amenities like flat-screen cable TVs, iPod docking stations, coffee makers and minibars. The telephone lines have voice mail service. Bathrobes and hairdryers are available in the private bathrooms. These rooms may provide views of the ocean or the city skyline. This spacious suite has 2 queen bedrooms, separate sitting and dining areas, and a balcony overlooking Panama Bay. The amenities include a CD/DVD player, iPod docking station, and 3 flat-screen TVs. This suite features a balcony and panoramic views of Panama Bay, a minibar, coffee maker, and a flat-screen LCD TV and CD/DVD player. High-speed internet access is available for a fee. The amenities also include a separate sitting area from the king bedroom, and a large bathroom with a shower and bathtub. This room features exclusive access to the Club Lounge, which provides complimentary breakfast, drinks and evening appetizers from 6 pm to 8 pm, as well as a flat-screen cable TV, safe, iPod docking station and a private bathroom with a shower, hairdryer and toilet. House Rules Intercontinental Miramar Panama takes special requests – add in the next step! Intercontinental Miramar Panama accepts these cards and reserves the right to temporarily hold an amount prior to arrival. Staff was great. Breakfast was great. The intercontinental hotel in Panama its becoming garbage, no power in the room at check in, no water. the room is a joke the furniture is moldy, their is a coffee maker and 2 cups but no coffee sugar creamer or spoon. the room is advertised as a kitchenette but there is no dishes cutlery dish soap or towels. the safe does not work. the blinds were broken and the black out blinds were 6 inches off the floor. the only way to turn off the ac is with the multi breaker. the room is filthy. The beach was photo shopped because there is more black sand than white. to stay in the so-called luxury suites means you are not part of the main hotel area so you will have to walk a good distance to all of the amenities. if this is the luxury suite than I would hate to see the regular room. Booking .com. you should ashamed to offer this as luxury. Our first room. The pool bar was never tended. We had to call multiple times to have fresh glasses sent to our room as well as shampoos and soaps AFTER having our room cleaned. Lack of attention to detail. No hand shower. The fixed shower was too close to wall, your hand has to go through the falling water to adjust the knob. Imagine hot or cold water! Maid did not replenish sundries every day. View and location were hard to beat. The rooms are rather 3-4 stars than of a hotel of 5 stars. I didn't have any mini bar and no complementary water in my room. Nice pool outside and quite OK breakfast. Thew gym was cardio only - no weights - not good enough for me.